Can you say “absolutely awesome”?! 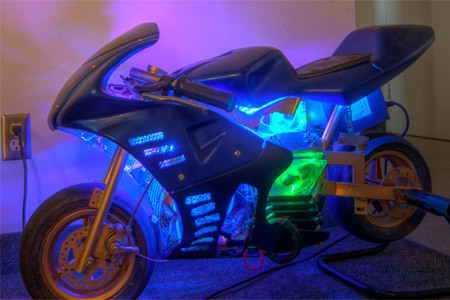 This is a custom PC case mod in the form of a pocketbike! And for those who are curious, no the modder didn’t waste a perfectly good pocketbike for a computer case mod! The bike was broken already and not just disassembled for the sake of a elite-looking computer case! You can view even more pictures of this pocketbike custom PC case mod Here. This entry was posted	on Thursday, August 5th, 2010 at 9:00 AM	and is filed under Cool. You can follow any responses to this entry through the RSS 2.0 feed. You can leave a response, or trackback from your own site. If I had enough money, I’d do that for fun too, except on a full sized one, and put a UPS on it, and speakers, and a mini monitor, all the while keeping the motor. 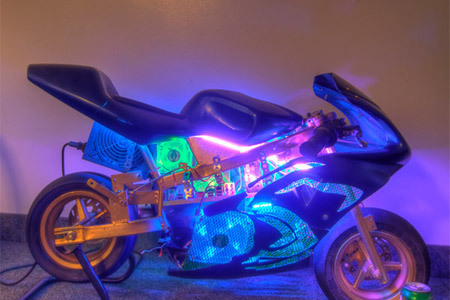 I wonder if thats even possible..
Yeah, it’d be a nice feat to keep the bike working still while having all those components in there too lol.